Our primary aim is to engage diverse audiences in designing and building their own technologies by situating computation in new cultural and material contexts, and by developing tools that democratize engineering. We believe that the future of technology will be largely determined by end-users who will design, build, and hack their own devices, and our goal is to inspire, shape, support, and study these communities. To this end, we explore the intersection of computation, physical materials, manufacturing processes, traditional crafts, and design. You can get all kinds of high-low materials easily on line now from sites like Transmaterial and Inventables: Dry-erase wall paint! 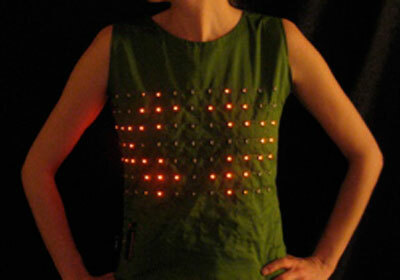 Temperature-sensitive fabric! Conductive foam! People living with dementia often exhibit a range of abilities — there’s no one set of specific symptoms. So Timlin organized his design solutions into three groups: low, medium and high assistance. 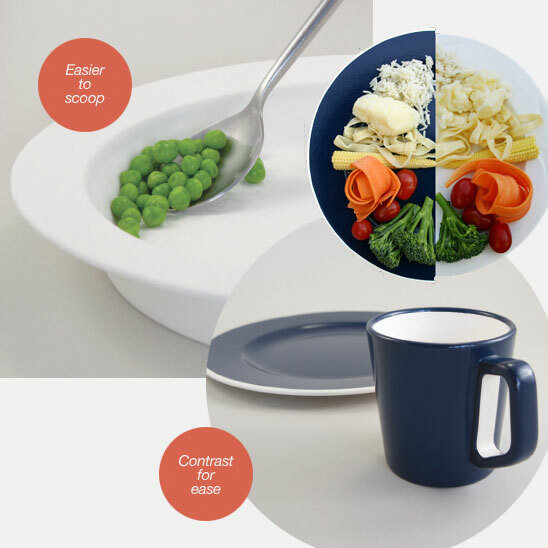 A low assistance cup and plate uses colored elements to help food stand out on the plate, and the plate itself contrast with the table. A medium assistance plate has a high lip that can help people with limited movement push the food onto their spoon. 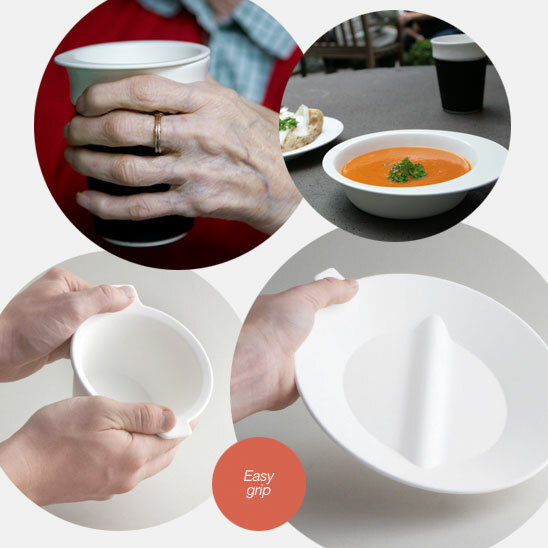 A medium assistance cup is insulated and features large handles that can be easily grasped with both hands, making for an easier grip. The high assistance plate is made for caregivers to feed residents, yet still allows the resident some sense of dignity. The subtleties of these designs are using simple ceramics, an ancient material. But what else could be added to these designs when you consider the low-cost, high-potential of conductive, thermal, sensing, or other materials that could be wed to cups and plates? Today we’re going to be exploring conductors; I’ll report back with my research here. Meantime, here’s a “living wall” the group made over a year ago—it shows their work with conductive paints and other responsive devices. There’s more on YouTube as well.